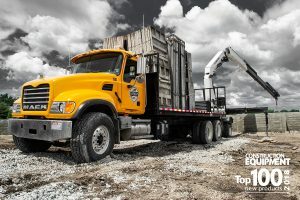 Mechanics Truck Gives Farm Productivity a Lift - Iowa Mold Tooling Co., Inc. : Iowa Mold Tooling Co., Inc. Questions to consider when choosing a truck for agricultural applications. Construction or farming? Virginia’s Jamie Lee spent his working life with one foot in each industry before committing to farming full-time a few years ago. A major factor in his decision was the desire for independence. Such freedom comes saddled with its own set of challenges, however. Tending to 1,300 acres with only the help of his father, Jimmy, Lee can’t afford any excess downtime. That’s why the grower of corn, soybeans and cotton has relied for years on a “shop on wheels” – a maintenance truck featuring a telescopic crane –on the family’s Flaggy Run Farms in Courtland, Va.
What are my intended uses for the truck? Lee hoped to be able to minimize downtime by bringing the shop to a broken-down piece of equipment rather than spending valuable time transporting the machinery to the shop and back. He also wanted a crane that enabled him to single-handedly change dual wheels on tractors and place pumps. “That crane does what two or three other helpers would do,” Lee said. What size and features do I need? After a thorough search, Lee chose an Iowa Mold Tooling Dominator I with an 11-foot body and loaded it with a hydraulic crane, a hydraulic air compressor, a welder, a 200-gallon fuel tank and other tools necessary to complete a wide variety of chores in the field. 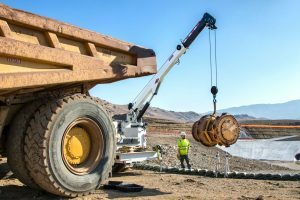 The crane features a 20-foot horizontal reach and 7,500-pound lift capacity, making it ideal for changing wheels and maneuvering pumps. “We pretty much can do everything with one truck,” said Lee. How much time and money could a truck save me? Jimmy Lee has not done the math, but he saw the value in a maintenance truck long before he retired from highway construction and joined Jamie on the farm in 2006. 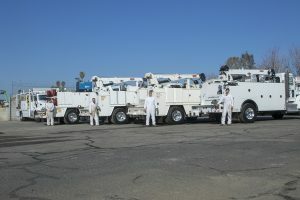 More than two decades ago, the elder Lee acquired a Dominator to serve as the primary maintenance truck for his construction business. It was so effective that he lent it to Jamie for use on the family’s farmland until Jamie purchased a new Dominator in late 2009.